Limerick is the place to be this week, with openings in the City Gallery last week and the School of Art and Design tonight. My pick of the week, Plane Invasion opens this evening at 6pm and showcases the work of over sixty different creative practitioners while also commemorating the life and work of the artist Orlagh Spain (1985-2012), who was a great artist and is much missed. Taking place at the Limerick School of Art and Design, Clare St, this exhibition will be opened by Anne Culhane and Des MacMahon. Each ‘Plane Invader’ inspired not only by the work of Orlagh Spain but also by a uniquely found collection of WW2 encyclopaedia. This has led to a multi-disciplinary exhibition that indirectly deals with themes such death, loss, strength of character, resolution, creativity and community. This exhibition is also a charity event with a percentage of monies raised going towards Pieta House. WASTELAND transforms the Limerick City Gallery of Art into a hypothetical place, an absurd playground overflowing with salvaged objects, postal packages, sculptures and debris. Nestled amidst its poetic surrounds the story of the artists’ attempts to dismantle and relocate a public park to a new location also unfolds. This exhibition explores the institutional rules and regulations that pervade our lives and what happens when things slip through the cracks. Wasteland marks the first collaboration between Czech artists Eva Kotatkova and Dominik Lang. WASTELAND was originally Commissioned by Project Arts Centre and curated by Tessa Giblin and toured from the Project Arts Centre, Dublin in 2013 to the Mermaid Gallery, Bray, Co. Wicklow, February – March 2015. Glasgow-born and bred painter Finlay Mackintosh’s life is given over painting. Using a variety of cameras (a Hasselblad, a Nikon, a digital one), Mackintosh explores Glasgow and sites farther afield (London, Venice), snapping photos to add to the vast collection of photos in his home studio. Then the work begins. Painting. For years, Mackintosh kept this up while working at a job; in recent years his art work has become full-time and all consuming. Local artist Martina Burke launches her exhibition Reflections on ART WALL at The Leitrim Design House on Friday the 10th of April at 7pm. Reflective drawings from everyday life are the main source of inspiration for her charcoal drawings, paintings and stitched pieces. Colour, pattern, textures and the creative possibilities of artistic materials play a large role in her work and are informed by a strong lifetime connection with drawing, painting, fabric and thread. 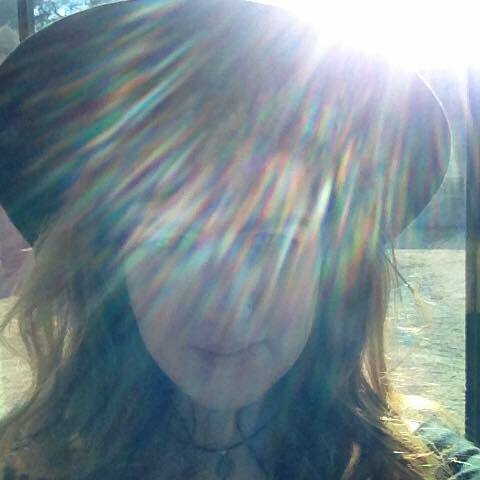 Martina shares her inspiration ‘In the midst of each day I am excited by little gem like moments. It may be fleeting images of children at play, people taking moments of reflection, spring flowers, winding lanes or amazing skies. I jot down little reminders on scraps of paper, backs of envelopes or notebooks. These treasured moments become the inspiration for much of my work. Reflections will launch on Friday 10th of April from 7pm and continues until May 27th 2015. Please join us for a glass of wine, meet the artist and immerse yourself in this diverse range of work in a variety of media. This event complements another activity happening in the building as The Dock Visual Arts programme launch their next exhibition at 6pm the same evening. So drop in early and make an evening of it with two free events for the whole community to enjoy! Recipient of the inaugural Roscommon Visual Artists Forum Award, Siobhan McGibbon exhibits a new body of work expanding on investigations undertaken during her on-going residency in Galway University Hospital. Fascinated by the solo experience of medical analysis, the work explores the patient’s interactions within the hospital environment. McGibbon is engrossed by the notion of the invisible normal, the irregularity of a microscopic cell, the uncontrollable multiplication of a chromosome or a hidden mass in an organ that are not perceptible to the human eye. Her work explores the methods and technologies used to diagnose the body that reveal these concealed glitches. McGibbon is interested in the objects, processes and sounds that create a new narrative for the everyday when experiencing illness. Her work attempts to recognize how these experiences can lead to the creation of a new normal. Siobhan would like to acknowledge the assistance and support provided by the staff of Galway University Hospital in realising this exhibition. The Roscommon Visual Artists Forum was established to provide visual artists based in or from the county with a platform to develop their practice. In response to the needs and requirements of the artists in the county, visual arts Curator in Residence Linda Shevlin, established the award. The forum is kindly supported by Roscommon County Council. Artist Sarah Stevens uses photography, sculpture and drawing to record homes, schools, hotels, train stations, factories and other empty spaces. These beautiful, decaying museums lie forgotten in every community in Ireland. Some are a consequence of the financial collapse, but many more have been around for longer. An exhibition of new paintings by Sligo based artist Emma Stroude at The Hyde Bridge Gallery, Sligo. The subjects of Emma’s paintings are a selection of carefully chosen derelict houses residual of another life passed on the very edge of the continent. Largely ignored, unloved and in some cases simply waiting for the tide to wash them to sea, these houses have become descriptive of themes dominant in Emma’s work at present – endurance, fragility, escapism and the notion of life’s transience all set against the changing light and weather of Ireland’s North West landscape. The Annual Members Exhibition will also be opened on the night and will feature the work of the Galway Print Studio artists and work by Margaret Irwin West. As well as the exhibition, there will also be screenings, talks and workshops including printer Mo West and award winners Patrick Furey, Holly Ellis and Ramona Burke, sign painter John Herrick and the Irish premier of ‘Sign Painters’ directed by Sam Macon and Faythe Levine. Admission is free and all work is for sale. The Olivier Cornet Gallery is delighted to present ‘CONTRAPUNTO’, an exhibition of new works by gallery artist Jordi Forniés. The show opens on Sunday, 12th April, 3 pm, at the Octagonal Room, City Assembly house (All welcome). The show, which is accompanied by a catalogue, will run until April 30. What Lies Within at Filmbase is Mary’s first solo exhibition. This eclectic collection of her work is diverse and illustrates the essence of abstract expressionism; spontaneity and subconscious creation. It showcases her mastery of colour, her love of shapes and texture and provides the viewer with thought provoking images. The exhibition runs from Wednesday April 8th until Tuesday April 14th and will be officially opened by abstract artist Michael Gemmell at 7.30pm on Thursday April 9th. The Carysfort Art Gallery is delighted to present Niamh McCarthy’s highly anticipated first solo painting exhibition The Beautiful and The Sublime. Niamh graduated from the National College of Art & Design in 2013 with an Honours B.A and MA in Fine Art. In 2011, Niamh was shortlisted for the Talbot Gallery & Studios Most Promising Postgraduate Award. Her work has been solicited by the Dublin Science Gallery, The Dublin Fringe Festival and The Kilkenny Arts Festival. Her latest series of contemporary landscape paintings explore the notion of beauty within nature. This collection of oil paintings consists of nine large scale contemporary landscape paintings. These pieces are inspired and set in the rural landscapes of Co. Monaghan, where Niamh works from her studio. Jo is inspired by the narratives that shape our lives: the stories, poetry and drama that we share and are entertained by. She also draws inspiration from the underlying narratives of the mundane, the everyday objects we use and the human experiences we cannot avoid. Her love of fairytales and folklore from all over the world comes across in her work and she likes to explore their underlying themes – along with how they can connect with our own experiences. Jo has been drawing, painting and illustrating all her life. Whilst living in Japan and Poland, in particular, she was deeply impressed and in awe of the art work produced by the people there. It continues to influence her work to this day along with the respect for art and craftsmanship that was evident in each place. Private View: April 9, 6.00 – 8.00pm | Post Preview Party at Berlin in Coppinger Row Dublin. New works on Paper and Digital Animations. Exhibition continues until April 28. Daniel Rodriguez Castro’s work draws on individual personality and how it comes into conflict with the group or collective. The artist uses the traits that identify and make every person unique in a society that tends to equate everything, ignoring individualities and classifying them in organizational structures. Rodriguez achieves this feeling of uniformity and organisation of various individualities with flat surface, grey and blue colours. In addition, the use of grid formats like borders or aerial views provide the idea of order and equality. Rodriguez´s work can bring about an innocent view of colours, elements or characters that becomes cynical with the awareness of the social aspects dealt with. The Doorway Gallery is delighted to host an exhibition by Kate Beagan called I came upon a Place on Thursday, April 9th between 6-8pm on 24 South Frederick Street. The exhibition will run until April 30th. I came upon a Place is a new series of paintings by artist Kate Beagan. The Hillsboro Gallery presents TONN, an exhibition of new work by artist Gwen O’Dowd. Oliver Sears Gallery is delighted to announce the opening of Spin, an exhibition of new work by acclaimed wood turner, Liam Flynn. Drawing on almost thirty years of dedication to his craft Flynn has assembled an astonishing collection of vessels turned and carved from ash, sycamore, eucalyptus and oak (ebonised and fumed). Flynn demonstrates a total understanding of his material and creates objects that are at once sympathetic and uncompromising, timeless and contemporary. Liam Flynn’s work is found in the collection of the Victoria Albert Museum, London the Minneapolis, Institute of Arts and the National Museum of Ireland. Liam had a survey exhibition in the Hunt Museum in Limerick at the end of 2011. The exhibition continues until 14th May 2015. Graphic Studio Gallery is pleased to showcase Daniel Lipstein’s solo exhibition featuring an array of etchings and aquatints, exploring theories on meditation and compassion. The exhibition derives from the titles of two of Lipstein’s etchings, and for the artist it is this combination of ideas that ponder on the very nature and meaning of true compassion. Delving into spiritual and intellectual ideals throughout his subject matter, Lipstein invites the viewer to conclude their own narratives behind each print. Thus creating a world open to interpretation —taking inspiration from abstract expressionist ideas appearing in the work of Pollock and Rothko, dating back to French expressionism of the early 1900’s— Lipstein’s work is imbued with hidden meaning. Through each layer of the printing process, he builds an entirely new visual surface, re-invigorating the resulting work as a whole, while still maintaining each layer’s individual strength and beauty. This maze of marks and celebration of colour packs a strong emotional impact. Open to the public daily from 10.00-4.00 p.m. Adm: FREE. Born in 1929, Thomas Ryan attended the Limerick School of Art, then the National College of Art in Dublin, where he studied under Seán Keating and Maurice McGonigle. In 1957 he first exhibited at the RHA and became an associate member in 1968. He has had many commissions for portraits and he is also well known for his sensitive still-life paintings and for his Irish historical scenes, especially those of the 1916 Rising. He has exhibited at the Municipal Gallery of Modern Art in Dublin and was President of the RHA from 1982 to 1992. The Cross Gallery presents Pavilion, an exhibition of work by artist Graham Chorlton. Photographer Agata Stoinska & producer and art director Eddie Shanahan set their Wilderness project at the edge of the clouds high in the Knockmealdown mountains, where ribbons of green velvety moss drip from wind tortured trees, where silver streams cascade violently through karst cut loose as far back as the ice age, where the black mirror surfaces of corries and lakes reflect the ever changing sky. Wilderness explores and celebrates captivating landscapes, indigenous textures, poetic imagination and inspiring heritage and contemporary craftsmanship. WILDERNESS is a photographic art exhibition comprising 10 stunning images printed on high quality art paper and framed in beautiful washed lime frames. The images are innovative, edgy, raw and beautiful. One Eye Sees The Other Feels by Natalia Black is new exhibition that runs at the gallery from 25th March until the 7th of April. With this show NAG Gallery brings to action it’s new program of offering up and coming as well as established artists an opportunity to hire it’s space to showcase their projects outside lengthy curatorial programming and thus bring about high quality fresh exhibitions. Without a gallery commission 100% of sales goes to the artist. Kevin Kavanagh presents A Million and One Things Under the Sun, a new body of work by Diana Copperwhite. “Copperwhite’s paintings follow a logic of their own, they are recycled and they grow out of one another by remaining susceptible to the materiality of paint. She often interjects with obstacles that she brings to bare on the paintings in a way that encourages them to define their autonomy. This approach allows for accidents to happen yet these accidents are staged purposefully to allow the paintings to escape from her grasp. In this regard they have a character and vibrancy that evidence the pursuit of an epiphany, whereby the painting surprises the artist as often as the artist exacts change upon the painting. She is a painter who is fully taken up with the act of painting and the materiality of paint. The galleries are open from 10am to 6pm, Monday to Saturday, and until late on performance evenings. Admission is free. A solo exhibition by Dublin based artist David Fagan, He saw the world and was left wanting at Siamsa Tire, Tralee, features a selection of audio-visual pieces that explore viewer engagement with both place and time. Crawford Art Gallery is delighted to present Kathy Prendergast Or, an exhibition of new and specially commisioned work. This exhibition brings together recent work by Kathy Prendergast, a London-based Irish artist. Over more than three decades, Prendergast’s work has consistently addressed themes relating to identity, landscape, mapping and power. Always rooted in the physical world – reinforced by her use of low-tech materials and by the way in which her work is often painstakingly hand-made – Prendergast creates work at the intersection between the material and the conceptual. Kathy Prendergast and curator Ingrid Swenson will be in conversation at 6pm, Thursday 23 April in the gallery, prior to the launch of the publication to accompany the exhibition. The publication features new texts by Tanya Harrod (independent design historian and author); and Ingrid Swenson and is published by Crawford Art Gallery, Cork. Patching the Void, colour etchings and poems with related paintings and drawings by Tim Goulding. The images, a suite of six colour etchings based on unravelling and patching. The inspiration comes from energetic particles, veins, threads and used textile surfaces; thereby making sparse poems with textural and calligraphic features, with a nod to the Wabi-Sabi aesthetic of Japan. The poems are of investigation on the path of self-realisation. They speak to the part of us that loves truth. No wonder then that they are unflinching in their acceptance of whatever presents itself; celebrating the sacred in the commonplace. The paintings and drawings are from the Patching the Void series which inspired the creation of the limited edition prints at the Graphic Studio, Dublin and launched at the Taylor Galleries in February 2015. The exhibition will be opened by Pat Coldrick, classical guitarist, on Sunday 5th April at 4pm and it continues until Monday 11th May. Drawing is one of the oldest forms of human expression, with evidence for its existence preceding that of written communication. Drawing is used to express one’s creativity and therefore has been prominent in the world of art. Throughout much of history drawing was regarded as the foundation for artistic practise. PLAN A + PLAN B Project is an innovative exhibition consisting of print works by 20 members and supporters of Limerick Printmakers. The exhibition offers the 20 invited artists and includes artworks by each artist working individually (PLAN A) and another selection of artworks (PLAN B) which are the result of these same artists who joined together in pairs to produce in collaborating a single artwork per pair. The goal of the PLAN A + PLAN B PROJECT is to provide the artists with a unique opportunity of artistic and technical collaboration and to provide the audiences with works that demonstrate the full range of contemporary printmaking styles and processes. 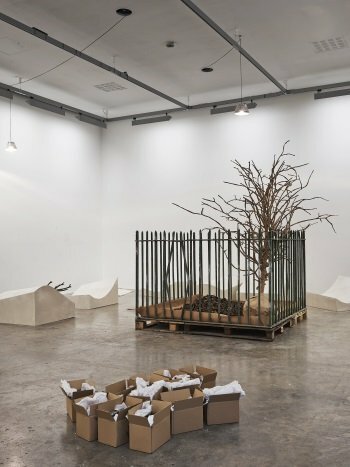 Wasteland will transform the Limerick City Gallery of Art into a hypothetical place, an absurd playground overflowing with salvaged objects, postal packages, sculptures and debris. Nestled amidst its poetic surrounds the story of the artists’ attempts to dismantle and relocate a public park to a new location also unfolds. This exhibition explores the institutional rules and regulations that pervade our lives and what happens when things slip through the cracks. Wasteland marks the first collaboration between Czech artists Eva Kotatkova and Dominik Lang. Project Arts Centre on Tour | Originally Commissioned by Project Arts Centre and curated by Tessa Giblin. Supported by The Arts Council / An Chomhairle Ealaíon Touring and Dissemination of Work Scheme. Toured from the Project Arts Centre, Dublin in 2013 to the Mermaid Gallery, Bray, Co. Wicklow, February – March 2015. The Plane Invasion is an exhibition of monumental endeavours, not only showcasing the work of over sixty different creative practitioners, it is also an exhibition commemorating the life and work of the artist Orlagh Spain (1985-2012). Taking place at the Limerick School of Art and Design, Clare St, this exhibition will be opened by Anne Culhane and Des MacMahon. Each ‘Plane Invader’ inspired not only by the work of Orlagh Spain but also by a uniquely found collection of WW2 encyclopaedia. This has led to a multi-disciplinary exhibition that indirectly deals with themes such death, loss, strength of character, resolution, creativity and community. This exhibition is also a charity event with a percentage of monies raised going towards Pieta House. Spolia is Robert Anderson’s first solo exhibition at The Golden Thread Gallery’s Project Space. Historically, the practice of “spolia” refers to a process of acquiring and reusing architectural fragments from ancient civilisations. The reuse of material is also a signature of Post-modern appropriation practices. This exhibition will endeavour to contemporise an understanding of this ritual. Recent exhibitions by Anderson include Empty Bodies (2014), where he explored the relationship between sculpture and photographic documentation. 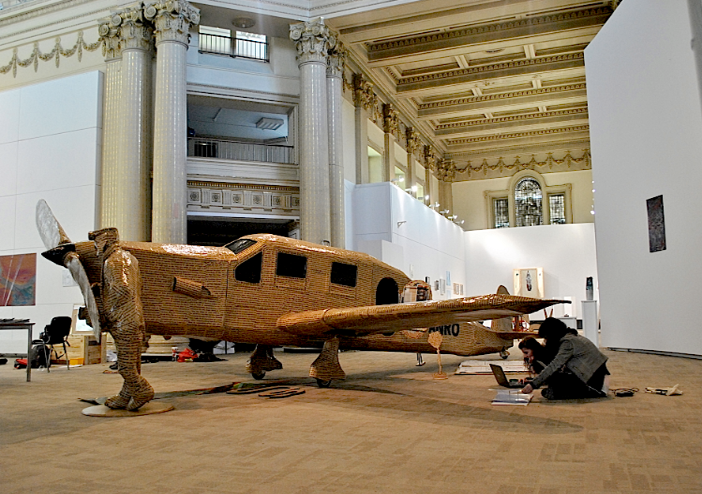 The exhibition was a site-specific work incorporating various image-based elements within sculptural assemblages. In AFTER THE FALL (2015), he developed this notion of disjuncture between art and its locations by attempting a reformulation of ‘the artist’s studio’ within the gallery space. Catherine Keenan is an award winning glass artist based in Portstewart. Catherine spent a one month artist residency in Belfast Print Workshop working on a series of screenprints. Catherine explains “I am interested in the possibilities of exploring the translucency of colour possible in printmaking processes. An element I explore in my blown glass pieces is the translucent and opaque properties of glass, how colours overlapping creates a third colour and how opaque colours mask interior colours. I wish to use printmaking to explore my ongoing interest in striped glass”. We will be exclusively exhibiting these screenprints alongside Catherine’s new glass works. The exhibition will be officially opened by Craft NI Chief Executive Alan Kane. Iontas Gallery is pleased to announce the opening of Facial Awareness By Evelyn Suttle. ‘Facial Awareness’ is a series of mixed media portrait paintings by Irish portrait artist Evelyn Suttle. For the past year the artist has been researching a variety of theories regarding the human face – our perception, our evolution and our attraction to the face. These include theories from various papers on how we recognise and detect the face, why we are attracted to some faces more so than others and whether we can determine a person’s character from the face. Each painting represents a different idea depicted through a different face. The importance of proportions, curves, light and expressions are highlighted using different media, including typewritten ink quoting the theorists which inspired the artwork. Evelyn Suttle is a Dublin-based visual artist and professional portrait artist, working predominantly in water colours and mixed media. A dialogue between Ursula Burke, Iulia Ghita, Nikolaj Bendix Skyum Larsen, Timea Oravecz. An exhibition presenting the work of the 18 Artists who completed a residency at the Golden Art Foundation during 2014. Irish artist Enda O’Donoghue has been kindly funded by Culture Ireland.